I flew from Gothenburg to Amsterdam and then to Manchester. The airport security people are fascinated by me and my bag. It always gets two passes through the x-ray and then gets unpacked. They also seem to think that my batteries are dirty as they always wipe them with a tiny cloth (do they look that much like explosives?). But I never get any trouble. I simply explain what they are and why I need them and the always let me pass. On this trip I brought 10 3S 2200’s for the tricopter, 2 2S 900 Fatshark batteries, and a 2S 2300 for the transmitter. I packaged them individually in plastic bags to reduce the chance of them getting shorted out, something that airport security like it when you do. I would recommend only bringing as few batteries as you can to avoid making them more nervous than necessary at the airport, and to shorten the time you have to spend on explanations. When they booked my trip they had trouble figuring out how to transport me between Manchester and Blackpool. In the end they decided that, since I have a drivers license, I could drive my self. So they rented a small Toyota Aygo for me. Never, ever drive in the UK if you don’t absolutely have to. First of all you sit on the wrong side of the car. The shift stick is on the wrong side. The indicator leaver is on the wrong side. The windscreen wiper leaver is where the indicator leaver should be. Everyone drives on the wrong side of the road. Roundabouts go the wrong way. There are way to many cars on the road. And people drive like their pants are on fire! I never been so stressed out while driving. Not even during my drivers exam. It took just over and hour to drive from Manchester to Blackpool, but it felt like a whole day. Without a GPS I would probably still be in traffic somewhere. I’m so glad that it worked. Sorry for the rant but it was a horrible experience. It didn’t make thinks better that it was rush hour. I finally got to the hotel, without a single accident and not to many people had honked at me. At the hotel, I unpacked my gear and inspected it for damage. The Helical receiver antenna was broken, but nothing a little CA couldn’t fix. Unfortunately one of the switches on my Aurora 9 had been ripped of. Even though it was rapped in many layers of plastic, and was in the middle of the case. The tricopter looked to be in pretty good shape. The props I had balanced the day before looked a bit crocked though. I spooled it up and it was horrible unbalanced. I bent and fixed as good as I could and got it to the point where the vibrations where nearly gone. After that I went to sleep. Next morning I got up early and got ready. I met up with the film crew and pyrotechnicians in the lobby. I talked with the director about what the expectations where and what he wanted me to shoot during the day. I got some really good directions and I felt well informed. I decided to walk to the pier where the fireworks were going to be set up. It was about an english mile there, so not too far. During my walk it started to rain lightly. The weather didn’t look good at all. It was really gloomy and the winds were really strong. According to the forecast it was blowing 25 MPH winds, and I believe that was far from an exaggeration. At the pier I talked with the producer and told him about the trouble of getting good footage during the rain. The GoPro has such a small lens that a droplet of water can ruin the whole shot. We agreed that I should wait until the weather cleared up. While waiting my friend Martin (badlands) turned up. He had agreed to come out and help me for the day. He is the guy that did this awesome video I featured a while back. He is one of the nicest people I have ever had the pleasure to meet! Very cheerful, kind, easy going and really easy to talk to. He had brought his tricopter and it was cool to see another approach to the same design. We talked for an hour or two until it stopped raining. Time for the first flight. It was still extremely windy. The tricopter barely moved forward on full throttle! However I managed to get some decent shots of the crew setting up the big fireworks display on the end of the pier. I did a couple of more flights and reviewed the footage on my laptop. I noticed that I had some ”jello effect” due to vibrations. 1080p on the GoPro is anything but forgiving so I tried rebalancing the props on site. It got a little better but I was still not satisfied. I ended up replacing a couple of props. Firewoks on the end of the pier. 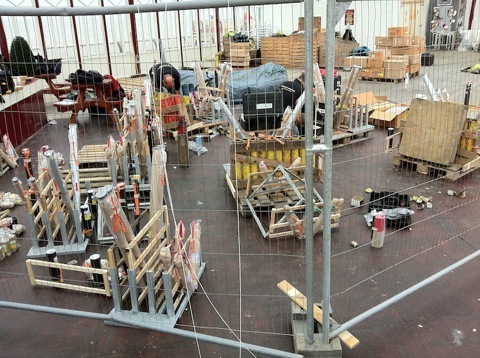 Fireworks being pre-wired for the 6 stations along the pier. The weather got better and better during the day and the winds died down to a mere 5 MPH. It was perfect. I got some really good flights in and collected some really good footage of the crew setting up, the area, the town, the pier, high shots, low shots and more. At around 1PM the whole crew took a lunch break. So we had one as well. 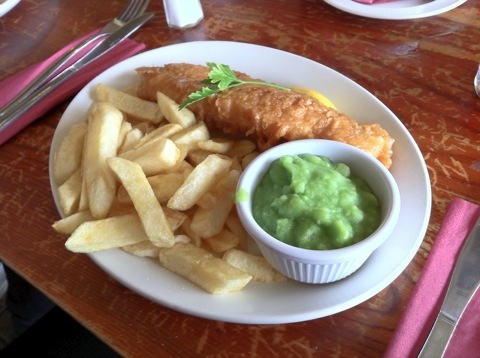 Since this was my first time in the UK I just had to have some ”Fish and chips”. It was surprisingly good to be honest. Better than I expected. I got a real chock during our lunch break though, when I asked what it was that Martin was dripping on his french fries. The sun came out on the afternoon and it felt like a totally different day. From gloomy, rainy and windy to calm, sunshine and a beautiful sky. We flew many, many flights and got some awesome footage. Half of the pier was closed down at 4 Pm and the pyro guys started putting up their 6 pre-wired stations along the entire side of the pier. 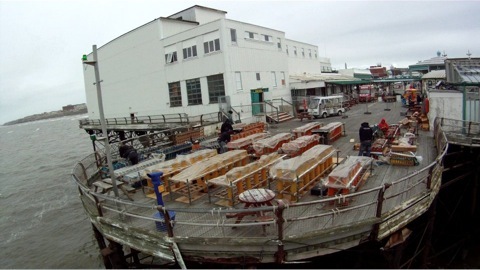 At 5 PM they closed down the entire pier to preparing the wiring to the control-room. The vibrations I had earlier were nearly gone throughout the whole RPM range and I was very happy. We flew pack after pack without incident. The sun crept further and further down and it was soon time for the fireworks display. To be able to fly after sundown I had brought a WDR600 ”normal” style camera that is really light sensitive. I mounted this on the side of the GoPro and aimed it parallel to the GoPro lens to get an as well framed picture as possible. The WDR600 is an awesome night camera! It was no problem navigating during the test flight and I felt confident in flying out over the water and get the fireworks from above. – Blackpool! Are you ready!? Time to get going! Adrenaline was pumping hard. Would I be able to get the footage I was supposed to? An ear deafening roar broke the silence as the fireworks closest to us started spewing out columns of colorful fire. I was not prepared that it would start so suddenly. But I took my time and made sure that the GoPro was recording and that everything worked properly. I sat down on the bench beside the ground station, jammed on the video goggles and gave full throttle. The fireworks were so powerful that I could feel the vibrations in my whole body. I flew on the outside of the pier to avoid getting hit by the fireworks, but still have something to navigate by. The ocean was totally black and not even the WDR600 could make any outline when looking straight at the ocean. Just before the fireworks had started they had turned of the light on the pier, extinguishing the only constant source of light I had to navigate by on the way out. Luckily the fireworks were going off at such a rapid pace that it illuminated the pier and I could see what the tricopter was doing. 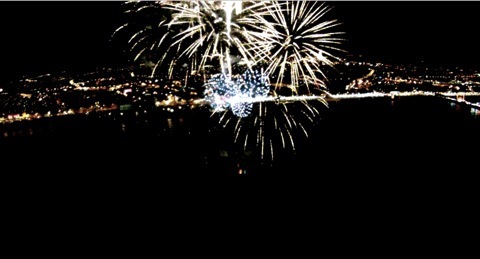 The director wanted to get the town in the background so I had to get all the way past the big firework display placed at the end of the pier. I was on full throttle trying to get out there as quickly as possible. The fireworks were timed to music and just as I passed over the edge of pier, there was a pause. It became pitch black. I had no reference at all. No light source anywhere. I jammed the rudder stick full to the right to yaw the tricopter around towards the town so that I could get horizontal reference. Two seconds of total darkness passed. 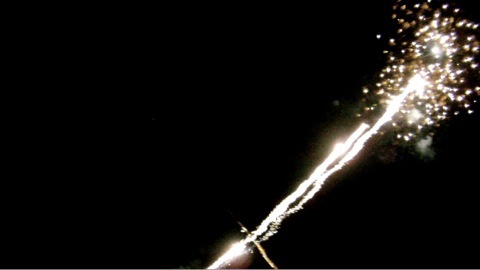 Then from the down left corner of the screen, two huge streaks of light shot diagonally passed the screen. I immediately threw the roll stick to the right and got it level. Now I could also see the town lit up. I had lost a lot of altitude from being sideways for so long, but now I was back in full control. I climbed to altitude and framed the shot. The fireworks continued for a while and I got some good footage. Then all of a sudden the fireworks stopped and the music was gone. – Is if over? That was short? – I don’t know, replied Martin. – Should I get back and change the battery? – I’m in the freaking fireworks!! Full throttle forward and down to the right to get out of the line of fire. I came in a little hard on landing but luckily Martin caught the tricopter. We changed the battery as quickly as we could and then I took of again. I got some really nice footage of the 6 firework stations along the pier on my way out. I turned the tricopter around and backed the final way to always have some light in the picture to orientate from. I flew around the hugh fireworks and got 9 minutes of good video before heading back for another battery change. I got down safely, and the change was pretty quick. Once again, full throttle and out to the end of the pier. The intensity of which the fireworks were shot were amazing. Bang after bang of beautiful silver crowns. Just as I got up there and framed the shot the fireworks stopped. This time the display really was over. Nothing else to do but to get back and land. Martin caught the tricopter for me yet again. We both were so pumped up after the flight. It was a long time since I felt this kind of rush after flying. A couple of high fives felt appropriate. Without Martin this day wouldn’t have gone half as smooth. He helped out a lot more that I think he realizes. He helped spot for me, aim the antennas, catch the tricopter in difficult landing situations, carried stuff. But most importantly he kept my mood up. We talked all day about all different things and stayed active. The day just flowed on perfectly without much hiccups or problems. He made me relax and do a better job. So a big thanks to Martin for taking the day of work and driving 100 miles just to help out. Cheers my friend. It had been a long day. 24 flights had been done. Over 200 minutes of video material had been gathered in just one day. This is my personal record in flights in one day. I was really pleased with what I had accomplished and I hope the production company feel the same way. The next day I flew home (after another one of these delightful driving experiences). I was really tired but pleased and at ease knowing I had done a good job. So there you have it folks. The UK adventure of 2011. 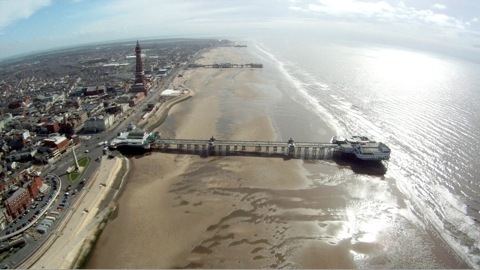 ← Anyone near Blackpool in the UK?